I had a "light-bulb moment" today - and if you are a craft nerd, pay attention. For some strange reason I decided to start on another crochet blanket yesterday (remember the Giant Granny Square blanket). I think it was a combination of inspiration from Attic24, and also the fact that crafting helps keep me sane. When the kids are going crazy, the bird is squawking, dinner is overdue and the washing pile looks like a monster, hiding somewhere and hooking a few rows helps to calm my nerves (wow - I really do sound like an addict). But I don't just want to have to hide away to craft, it's really nice to be able to take it with you when you go visit friends and family, when you are out at a park or beach... it's not just something to be done behind the secret curtain. The problem is that some of us crafting peeps are a bit shy when it comes to doing our thing in public... especially if we experience a bit of taunting from the "non-crafters" out there in the world (remember my crochet persecution?). I know there are others out there - so I came up with a plan! I have made myself a goal for over the next little while, and I want you all to feel free to get involved. I am going to make crafting in public cool again (hehee) and you guys are all welcome to join in!!! I have created a flickr group for the photo's to be added to, or else you can email me your photo and I will post them right here on my blog. The details are all here on the flickr group: Craft Nerds Going Public! but remember, photo's of you crafting at your Nana's house aren't counted! Looking forward to recording my journey - and seeing some of you get involved too! great idea!!! I took my crochet to the beach today - lol! It looks really unusual and for some reason it is straight on one side and really crooked on the other... not to worry, I will definately join as a craft nerd.. I knit in the car waiting at school.. does that count or should I get out and sit with the other mums with my knitting? On the beach, in the car - all great places that are public!!! Yay! and the fact that I can't for the life of me get passed a chain stitch has nothing to do with it. Nothing. 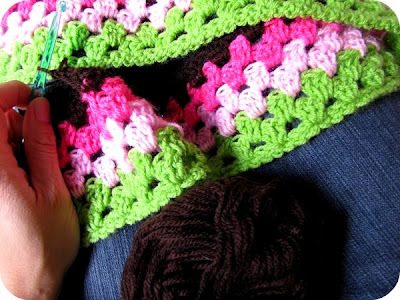 i just started a granny "stripe" blanket that i seen from attic 24..loove that site! Can we change it to "Nutters"? I'm a self-confessed Crochet Crazy myself - and it has a nice ring to it - don't you think? "Craft Nutters" or "Craft Crazies"?? I also do what Leonie does - if I get there early that is!! Such a great idea - hope I remember to snap when I'm in public! Hi, I found you over on I crochet. Your granny stripe colors look fantastic. I like the idea of craft/public experience, the how to photograph is going to be a bit of a challenge. Nice Blog, glad I stopped by. You are SUCH a NERD!!!! oh I want in ! Thank you for finding me and leaving a sweet comment. love your granny so far! I always crochet in the car!! And I often get accused of hauling a "granny bag" around with my stitching or crocheting... drives me crazy :) IT'S NOT JUST FOR OLD LADIES!!! now I just need to learn to something more portable...!! I don't care about crafting in public at all. It sounds like you're going to have so much fun! 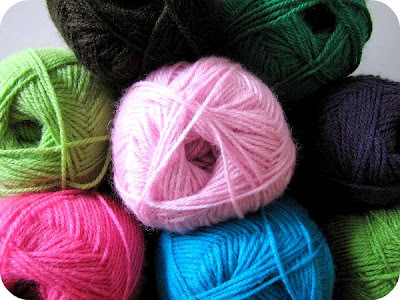 :) I really want to learn to knit, but don't know the first thing. I crochet in the car too! My husband likes when I do, so I don't pick on his driving :) I was actually just thinking that on my 4 hour road trip this coming weekend I will be able to get so much of my current project done, which happens to be a granny stripe! I'm always crocheting in public, this week I have done it in the cinema whilst waiting for the film to start, at the park and had a cheeky little go at Costa Coffee whilst waiting for hubby to get the drinks. I will be joining your flickr group what a fab idea. I didn't know about this last week, otherwise I would have taken a photo, but I sat in the 'parents waiting room' at Randwick Children's Hospital while my daughter was in surgery and taught myself to do 'ripple' stitch (using attic24 tutorial too!). I'm working on a rainbow Granny Stripe blanket and I was working on it in the waiting room at the hospital while waiting for my husband to get a "scope" -- and *EVERYONE* was fascinated with it, I made all kinds of new friends! So cool! I have made tiny balls of yarn and put them in a little bag to take my crochet work with me in the train. It was cool to do! It was cute ^^ she waved me goodbye the next stop, but I love these kind of reaction from people. Though, I must confess, on my way back, it was getting late, and there were bunches of guys occupying the train who had just gone out somewhere, talking their cool guys talk. And, as a sissy, I let my crocheting work in my bag, afraid of harsh comments.